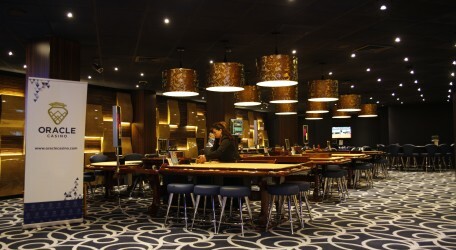 The Oracle Casino is the first casino in Malta to introduce a sports lounge, heralding an exciting concept to the local gaming industry following a refurbishment programme costing in excess of €500,000. The refurbished Oracle Casino was inaugurated today by the Minister for the Economy, Investment and Small Business, Hon. Chris Cardona. A re-branding exercise was also unveiled for the Oracle Casino which attracts around 250,000 visitors every year. This was the first major refurbishment of the Oracle Casino since it opened its doors in September 1998. The new sports lounge boasts 13 screens all showing live sports from around the world including the popular UK horse and greyhound races. The refurbishment programme saw over 2,000 square meters of the Oracle Casino remodelled, two new bars added and access for disabled persons improved among other enhancements. New slot machine themes were added to the gaming floor. These include branded titles from the well-known 80’s movie “Flash Dance” and games from “POP CAP” the inventors of games like “Bejewelled” that sold over 50 million copies through the internet. Tumas Gaming Chief Executive Officer, Yorgen Fenech, said that the refurbishment project was based on bridging gaming, innovation, and entertainment. “Our philosophy, as a hotel-based Casino, has always been to offer an entertainment destination for adults, offering a holistic experience rather than merely a gaming environment. The refurbishment brought a plethora of exciting changes and new services, that all point towards an extremely exciting future ahead for the Casino team and most importantly our patrons.” The Oracle Casino is owned and operated by Tumas Gaming, a fully owned subsidiary of the Tumas Group.